Hours spent working in the wrong chair can actually hurt. Improve your comfort in an instant with the Gesture Drafting Stool by Steelcase. The Gesture Drafting Stool boasts a unique design that allow its arms to move the way yours do, letting you move them as far away or as close as you need to sit comfortably with your computer, laptop, tablet, or phone. Make sure your chair arms are working with you, and not against you. But what about recline? Lean into ideal working comfort thanks to its body-supporting core interface, which ensures you're always sitting with the correct amount of push back. Then let's talk about the seat. 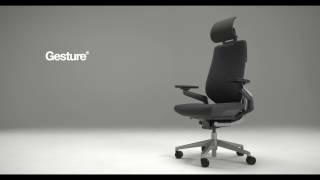 The Gesture's flexible perimeter in the seat allows for as many sitting positions as you need to keep you tasking comfortably. This is crucial for those long days spent sitting in your chair plugging away at your latest project. All of these advanced technologies come together to deliver world-class seating support at a taller height for you. Personalize the Steelcase Gesture Drafting Stool in your choice of vibrant fabric options to keep you working in stylish comfort. The Steelcase Gesture Drafting Stool can be ordered with a hard plastic shell back or a partially upholstered ''wrapped'' back style. The Steelcase Gesture Drafting Stool is available in multiple frame color combinations: black with black accents, Sterling dark frame with Merle accents, Platinum frame with Merle accents, or a Platinum frame with Seagull accents. The base of the Steelcase Gesture Drafting Stool is colored to match the chair's frame. A polished aluminum base can be selected as well. The Steelcase Gesture Drafting Stool can be ordered with or without a height-adjustable lumbar support. This optional support allows for 4'' of height adjustment for added support in the lower back. Select hard casters for carpeted floors or soft casters for hard floors, including concrete and tile. Plastic glides are also available for users who would prefer for their drafting stool to stay stationary. $1,157.00 List Price: $1,837.00* The list price is the same as the MSRP (Manufacturer's Suggested Retail Price). It may not necessarily be the price at which the product is sold.